Sholay was undoubtedly a milestone for Indian cinema. It’s been 40 years since Sholay has captured the imagination of not only the film makers but also the audiences. Sholay is the one of the greatest movie in Indian Cinema. On the occasion of its 40th anniversary, we share with you some of the trivia of this Indian classic. Sholay was India’s first 70 mm, stereophonic sound film. It premiered at Bombay’s Minerva theatre on 15th Aug 1975, but the premier was done with 30 mm print because 70 mm prints were held up in the Customs Department. 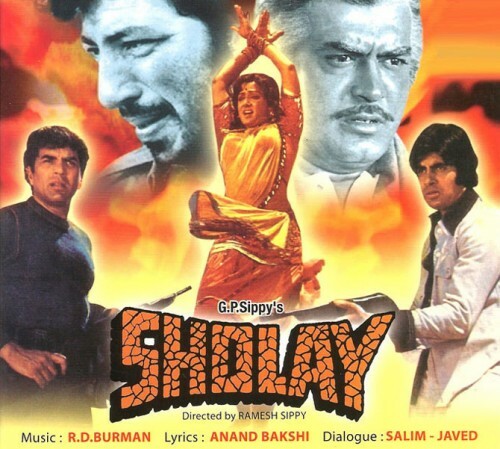 Polydar Music Co. released 30,000 records of Sholay’s music in the market 2 months before the release of the movie. The initial response was very poor. Sholay was the first movie whose dialogue sound tracks were released in the market and it sold like hot cakes in the market and got more popularity than the music of the movie. It was about to be removed from cinemas due to low attendance figures but attendance started rising and word of mouth made it the biggest hit of Indian cinema with some screens playing the film for several years. The movie was released in other parts of the country on 11th Oct 1975 after it became successful in Bombay territory. The flamboyant Shatrughan Sinha was initially cast for the role of Jai, but Amitabh Bachchan convinced the producers that he was suitable for the role. Danny Denzongpa who was initially offered the role of Gabbar Singh was busy shooting in Afghanistan for Dharmatma (1975). He could not accept the movie and the reluctant second choice was Amjad Khan got the iconic role. Initially, Dharmendra was keen to play the role of Thakur Baldev Singh. He eventually relented when the director informed him that Sanjeev Kumar would play Veeru if that happened, and would get the heroine. Sanjeev Kumar had just then proposed marriage to Hema Malini, Dharmendra was in love with her and quickly agreed to do the role of Veeru. The famous overhead tank scene where Veeru threatens Mausi with suicide and Jai’s marriage proposal was drawn from a real life incident. Director Man Mohan Desai was first approached by the writing duo of Salim Javed with the story for this movie. He was busy with Chacha Bhatija (1977) and could not accept the project. Amjad Khan was almost dropped from the project because scriptwriter Javed Akhtar found his voice too weak for Gabbar Singh’s role. Amitabh Bachan was almost killed at the end of the movie when a stray bullet from Dharmendra missed him by inches. Amjad Khan’s calling one of his associates Sambha (“Arre o Sambha’, tera kya hoga?”) caught the fancy of not just moviegoers, but also producers. So much so that a producer promptly announced a movie titled Sambha. Hooked up by his character of “Soorma Bhopali”, years later Jagdeep himself made a film with the title “Soorma Bhopali” in 1988. This was the first film in the history of Indian cinema to celebrate silver jubilee at over 100 theatres across India. The film was shot extensively in Ramnagaram near Bangalore. There are huge rocks of granite in this town, which formed the backdrop of Gabbar’s hideout. As a mark of respect, the people of Ramnagaram renamed a hamlet in the town as Sippynagar after the director of the movie, Ramesh Sippy. In the original ending, the Thakur killed Gabbar. The Indian Censor Board did not agree with this ending, saying that its vigilante aspect undermined the rule of law and could adversely influence naive young minds. So, a new ending was created that showed the police running in at the last moment, arresting Gabbar, and specifically telling the Thakur that only the law has the right to punish criminals. Real Bullets were used for the close up action scenes. First scene shot for the movie was Amitabh returning the keys to the safe to Jaya. Basanti’s chase sequence was shot over 12 days. Jim Allen, Gerry Cramton, Romo Comoro, John Gant…some of the foreign technicians who worked on the action sequences. The opening train sequence took 7 weeks to shoot. 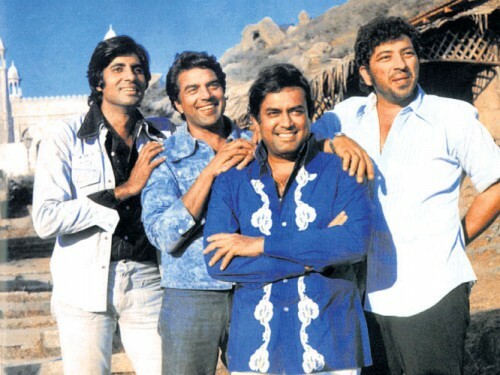 The last scene shot for Sholay was the one when Thakur meets Veeru and Jai outside the jail and offers them the job. 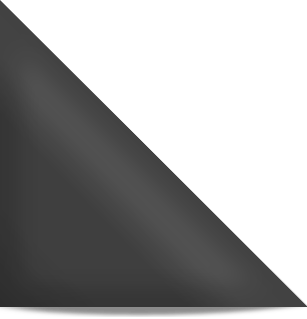 Amjad’s voice was nearly dubbed, as there were whispers that it was not being strong enough for a villain. Sholay’s Budget was close to 3 crores. Jaya was pregnant during the shooting of the film with her first child, Shweta. Jaya was glowing again during the premiere of Sholay…this time with Abhishek Bachchan. The first scene which Amjad shot for the movie was “Kitne aadmi the”? He gave 40 retakes to complete the final cut. Sholay had a Qawalli title ‘Chand aa koi chehra’ Qawalli which was chopped at editing table. Mac Mohan traveled 27 times from Bombay to Bangalore for the shooting of small role of Sambha. Sholay ran for 5 years consecutively in Minerva theatre at Bombay. Initially, veteran singer Mana Dey was to sing the famous Mahbooba Mahbooba song but when it was recorded in the voice of RD Burman the result were so good that Mana Dey requested it to kept in the voice of RD Burman only. Sholay was inspired from two movies ‘Seven Samurai’ and‘The Magnificent Seven’. Thakur Baldev Singh’s family massacre scene was inspired from an English movie “Once upon a time in West”. And it took 23 days to complete the shooting of this scene. Despite it being a super hit movie, Sholay got only one Filmfare award -Best Editing – MS Shinde. Amjad Khan bought his army khaki fatigue from the Chor Bazar of Bombay. Amitabh Bachan recommended the name of Amjad Khan for the role of Gabbar Singh as he had earlier worked with him in Saat Hindustani. Ye dosti hum nahi todege… this song was completed after shooting for 20 days. Amjad Khan death sequence was completed in 17 days. Sachin’s (Ahmad) death sequence was shot in 17 days and it was so violent that censor refused to pass it and was later edited and was depicted as Amjad Khan crushing an ant. 6 counterfeit coins with ‘Head’ both side were always ready at the location for Jai’s coin throwing sequence in the movie. There are only 9 scenes of Gabbar Singh in the movie. Gabbar Singh’s character was so famous that Britannia Biscuits made a commercial with Amjad Khan eating Biscuits. This was the first time that a negative character was used by a company to publicize its products. The advertisement was an instant hit with children and it impacted the sales. Hope you enjoyed reading the trivia of Sholay!